Need a swiffer duster sock? Well I did for my Unger so I cut up one white t-shirt and a small amount of a blue jersey sheet to crochet my duster cover. I cut my t-yarn 1 inch wide and stretched it gently as shown in my t-yarn making tutorial. My Unger is a squeegee with a swiffer-like head on the other side. I want to be able to use the other side to dust and clean high areas in my house with the extended handle on the Unger. I used the Craftstylish crochet reversible swiffer pattern as a basis for my duster cover. Because my tool is narrower than a Swiffer, I had to modify the original pattern. 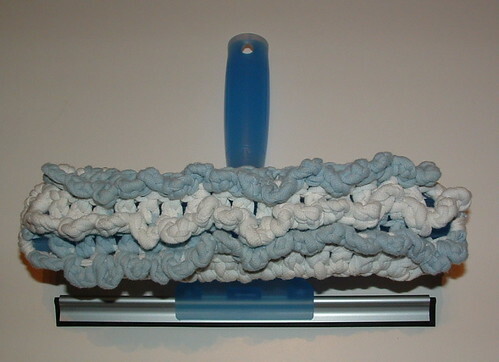 The beauty of the pattern is that it is easily adjustable to fit different sized cleaning tools. The pattern has great pictures and works up really quickly. I used N (9 mm) crochet hook. I chained 19 to begin my cover. I only crocheted 3 rows of ruffles in the middle. Then one round of SC in each stitch and then several decreases of Sc on last round to fit my Unger. Finished size: Fits a tool head 10 inches long and 1-1/2 inches wide when stretched. © 2011 My Recycled Bags.com - Powered by Wordpress.